When we first decided to write The Recipe Club, we wanted to explore the light and dark sides of friendship. We also wanted to discover how the act of writing letters and emails can create intimacy — but can also, inadvertently, fan the flames of misunderstanding. Our novel’s story charts the ups and downs of a lifelong friendship between Lilly and Val. Lilly, dramatic and confident, lives in the shadow of her beautiful, wayward mother and craves the attention of her distant, disapproving father. Val, shy, idealistic — and surprisingly ambitious — struggles with her desire to break free from her demanding, housebound mother and a father whose dreams never seem to come true. Despite their bumpy relationship, “LillyPad” and “ValPal” stay connected by forming an exclusive, two-person Recipe Club, exchanging letters and emails in which they share hopes, fears, deepest secrets — and recipes. The Recipe Club sustains their bond through the decades, regardless of what different paths they take or what conflicts threaten to break them apart. Readers can cook along with our characters as they travel through time facing the challenges of independence and the joys and heartbreaks of first love. Each recipe conveys the emotional complexities of family relationships, identity, mortality, and dreams deferred. So, for example, our recipe for “Wild Girl Wild Mushroom Salad” tells the story of the day Val finally allows herself to fall in love, going “overnight, from cloistered nun to unbridled lover.” She sends this confessional recipe to Lilly to celebrate and share her newfound joy and freedom. Note: Look for thin varieties of mushrooms, such as oysters, chanterelles, and shiitakes. If you use portabellas or criminis, slice them thinly to help them crisp in the oven. 2. Toss the mushrooms with 2 tablespoons of the olive oil, ¾ teaspoon salt, and pepper to taste. Spread out the mushrooms on a baking sheet. Roast, tossing once halfway through, until crisp and golden, 20 to 25 minutes. 3. 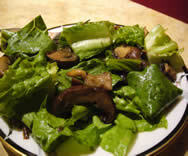 In a bowl, combine the mushrooms with the salad greens, the remaining 2 tablespoons of the olive oil, the vinegar, and soy sauce. Add salt and pepper to taste. Toss well.